HRD attestation is the verification and attestation of educational documents to use abroad. It is mandatory for completing the embassy attestation procedure. HRD attestation is compulsory when you apply for a job or higher studies abroad. For that, you need to attest the certificates from the embassy of that country in your home country. For the embassy attestation, you need to provide the state HRD attestation first. 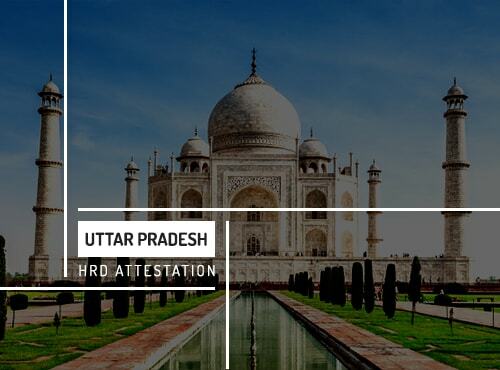 The Uttar Pradesh HRD department do the HRD attestation process in UP. Students who have completed their education from government recognized universities and schools (UGC/AICTE/NCERT) of Uttar Pradesh has to get their certificates attested from the state itself. UP HRD accepts only educational certificates issued from the state of Uttar Pradesh only. UP HRD attestation is compulsory for anyone who completed their education from Uttar Pradesh. It is required while migrating to another country for higher studies or work. Educational certificate attestation from UP HRD department is mainly done to prove the authenticity of the certificates issued from the state of Uttar Pradesh. It is done to verify that the educational certificates provided abroad are issued from government recognized universities and schools in your home country. UP HRD attestation is needed when you apply for admission in universities or schools abroad. Sometimes UP HRD attestation is also needed for verification purpose for getting employment abroad. Urogulf Global Services is an ISO certified attestation company approved by Ministries and embassies in India and abroad. We are the largest attestation company in the world that provides certificate attestation, authentication and verification services. Established in 2004, Urogulf has more than one hundred offices across India and abroad. HRD attestation process is an arduous task. We help and assist you in doing the HRD attestation process. We have a wide network of agents who have in-depth knowledge in the attestation process. Our agents will provide you guidance and information about HRD attestation according to the rules of each state. Urogulf can reduce your burden by doing the HRD attestation procedure for you. All you have to do is submit your education documents to our nearby office in your state. The main highlight of our HRD attestation services is that you can submit your educational documents in any of the Urogulf office in India. Contact our nearby offices for more information on HRD attestation.